The Day I Learned About the Outside Rein. As a young horse trainer, I was aware of this concept called “the outside rein.” But my understanding was entirely conceptual. Sure, I had an outside rein, we all have an outside rein. The rein that is opposite of the way you’re turning, simple. But my tools and techniques for navigating horses through the world were still rudimentary at best. If I wanted to turn right, I’d activate the right rein. For left turns, I’d activate the left rein. After all, that only made sense. This was also the primary instruction I received from any carriage driving instructors I’d taken lessons with. In fact, I remember one particular lesson in which the very highly rated instructor admonished me for keeping contact on the right rein in a left turn. “If you’re asking your horse to turn left, why in the world are you still holding the right rein?” she asked incredulously. Of course, being a curious sort of guy, I wasn’t content with simple driving lessons. I got my start in horses at a barn that mainly focused on three-day eventing and dressage. So I consistently went back to my roots for instruction with ridden dressage. There was even an incident that involved a low tree-stump, a two-wheeled carriage, and me making a long walk after my horse and carriage had left for the barn without me. In the post-incident analysis an instructor informed me that just prior to the stump, I was pulling on the wrong rein. “But the stump was to my right!” I insisted. 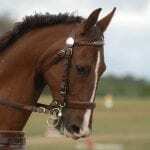 “Why would I ever pull on the right rein to avoid the stump that’s on my right side?” There was head shaking. Eventually, I did sort of gain some glints of understanding of balancing contact and the outside rein… sort of. I could ride a 20-meter circle mostly on the outside rein. But I wasn’t really 100% sure how I was doing it, and I thought some of the things I was doing to make it happen were little cheats. I was even able to translate some of that vague understanding into my driving, despite the fact that I was told by professional drivers that it couldn’t be done. “That doesn’t apply to driving because you don’t have an inside leg,” they said. Still, I was determined. My instincts told me that this is the same horse that I ride, so most of the principles that I rode under should work from the carriage as well. My complete understanding of the outside rein came to me in one of those rare lightning bolt moments. 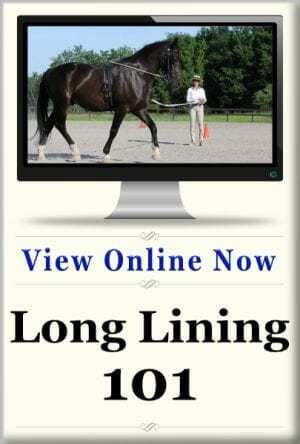 I was long lining a great-big Dutch Warmblood. This guy was a powerful horse with plenty of experience and opinions of his own. 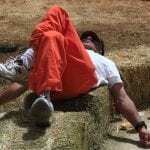 If he were a bouncer at a bar, the bounced would have bounced all the way to the next county. His particular issue was that he absolutely would not bend right. In any right turn, he would severely counter-bend to the left. This naturally led to him rushing through turns off-balanced. I was working him with my “Building a Half Halt” lesson plan (long before I had actually started writing these things out as actual lesson plans.) It seemed an obvious choice since this appeared mostly to be an issue with balance. 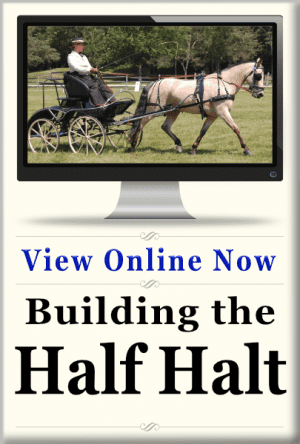 The half halt can be a balancing tool. I figured establishing a good half halt would help him establish better balance. Besides, he had a habit of blowing through half halts anyway. At some point, while we were duking it out on this long lining session, he got frustrated and blew up. I hunkered down at the end of the long lines, driving my heels deep into the dirt and leaning back to regain the upper hand. In the next moment he rounded up, and lo and behold, he was going around the circle in a nice big working trot with a passable right bend! Thrilled with the results, I kept him going for another lap or two and brought him to a walk and halt. I was no fool. I knew to “quit while you’re ahead” when you hit on something that transformational. This is when I discovered what really happened in that moment. As he came through his downward transition, and I relaxed my contact, his head and neck craned around to the left. Even as he stood after the halt, he held his head way off to the left almost as if he were trying to reach for something on his shoulder. It even crossed my mind that I may have broken this horse. When I collected up my long lines and walked over to him, I discovered the important detail. In the midst of his big surge, and my containing him with the long lines, the left rein became wedged in a piece of the harness saddle. I mean it was really wedged in there! In the moment that he returned to the trot, I relaxed my contact to him. Only, unbeknownst to me, my relaxation of contact only released the inside rein. The left rein still had the full force of my containing contact from the surge event. The outside rein was never released. He was then able to really use the outside rein as a balancing aid, and thus, went around like a champ. It was almost unfathomable to me that a horse could go around a ten-meter circle with that level of contact on the outside rein while bending correctly for the turn. It took me some time to process all of this. What I discovered was that what I thought of as providing adequate support on the outside rein, was far from it. In fact, simply keeping contact with the outside rein isn’t giving the horse any support at all if the weight on the inside rein is greater. I had been holding onto my old belief system that if I was turning right, the right rein should have the heavier contact. In the weeks that followed I focused on this concept. 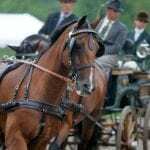 I did experiments with horses on long lines, in the carriage, and under saddle. It was like I was discovering a new land that no one had ever tread upon. 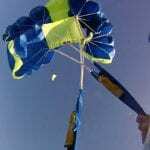 It really was a life-changing experience in my training. With that new understanding, of course, I was anxious to share it with my students. I figured out how to explain the whole concept in ways that I only wish someone had explained it me ten years earlier! I certainly owe great thanks to all of my teachers who tried and tried to help me understand the outside rein. But it was really this one experience with that horse that made the whole concept “real” for me. I’m not suggesting that the key to the outside rein is to use an ungodly amount of contact to haul your horse into balance the way I unwittingly did with the big horse. Since those early days of my career I’ve developed tools and technique to replace brute force. It was just this experience that really taught me in the terms that I could understand at the time how the outside rein works as a balancing tool. 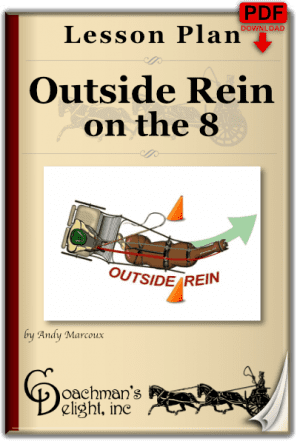 Of course, if you’re interested to know more about this, I’ll explain it all in detail in my upcoming class “The Outside Rein.” You’ll get all the fun exercises that I did without a horse that help you really feel the balancing effect of the outside rein on your body. 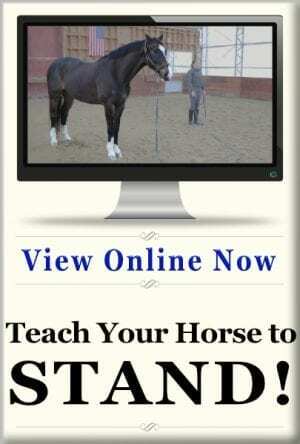 Of course, then I’ll give you exercises to do with your horse to improve his understanding as well. Don’t worry, you won’t have to go through the trials I did for it to sink in! Good stuff! I’m looking fwd to the online class. 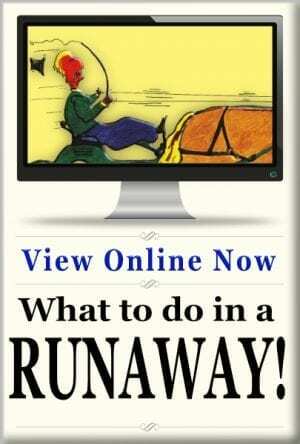 Your online classes are an invaluable asset to so many Andy and I try not to miss any of them! Can’t wait! 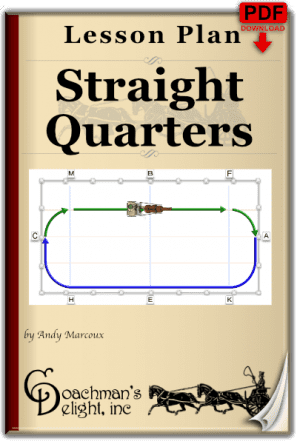 I can usually correct a horse that’s counterbending through a turn, but I have no way to explain it to a student. You’ll love the unmounted exercises I have that help people really feel the balance.